After a spectacular first entry and a less than stellar sequel, the third entry in the Mission: Impossible franchise got the action-spy series back on track with an adrenaline boost from J.J. Abrams. Mission: Impossible III is a thrilling, high stakes film and the most action focused installment. From the opening scene it’s clear the film is unlike either of the other Mission: Impossible movies. It opens with a captive Ethan Hunt (Tom Cruise) seeing his wife, Julia (Michelle Monaghan) held at gunpoint by terrorist Owen Davian (Philip Seymour Hoffman). Davian is counting down to kill her unless Hunt retrieves a weapon for him. And it true Abrams fashion, we flashback to Ethan being contacted by his IMF boss John Musgrave (Billy Crudup) to rescue agent Lindsey Ferris (Keri Russell). 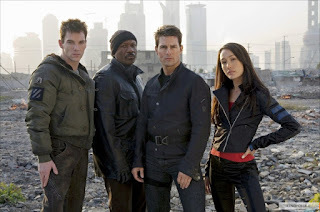 Of course Hunt does not go alone, he is joined by his tech whiz friend Luther Stickell (Ving Rhames), the transport expert Declan Gormley (Jonathan Rhys Meyers) and the background expert Zhen Lei (Maggie Q). Much like the first film, the team is utilized for the mission instead of taking a backseat to Ethan Hunt’s heroics. This writing and script allows the team members to have a little more character development as well. Stickell is able to talk to Hunt in the middle of a mission, newcomer Benji Dunn (Simon Pegg) is constantly worried about IMF protocol when aiding Ethan, and Musgrave’s boss Theodore Brassel (Laurence Fishburne) is a stickler who is at odds with Hunt’s freewheeling attitude. Hoffman gives Davian creates such an unlikeable, and truly loathsome villain, cementing himself as the franchises best. There is no fun quirks or anything that stands out about Davian, but Hoffman crafts a great, smart performance. 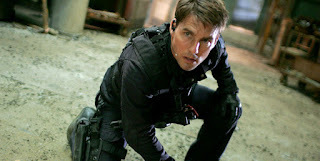 Tom Cruise is the best he has been throughout the first three films, truly settled into the role of Ethan Hunt. Throughout the story he gets to be a true action hero, while also bringing his romantic leading man elements he’d developed over the years. Impressively enough, this was J.J. Abrams' first round in the director’s chair. Abrams’ work on other projects, such as Alias, came in handy to develop the spy aspect of the film. Packing the film with crazy stunts and stunning set pieces, while not sacrificing character development, make his directorial debut a successful one.